Take a buffalo. Sauté it with butter and anchovies. Then breed it with a dragon, some dynamite, and a beagle. Put it in a cotton candy maker, cover it in chocolate sprinkles, and drive it through a car wash. Shove it all into a spray can and call it by the name of your favorite soap opera star. Then spray it all around the house and lick it off the walls. That’s a craziness that resembles Silly’s. Silly’s is a rare eatery that successfully manages not to have a cohesive theme. It’s sort of the Seinfeld of the Portland restaurant scene. A mish-mosh of people, food, scenery, and total randomness make up the awesome that is Silly’s. Their website even describes the application for employment as a plain white paper plate with which you can do whatever you want. It’s definitely a little different from your everyday yum-yum joint. First opened in 1988 and moved to its current location in 1997, Silly’s was sold in 2002 to current owner Colleen Kelley. Then, just a little over a year ago now, Kelley opened Silly’s With a Twist next door. SWAT is pretty much the same except with a full bar for those whose thirst requires adult libations. Both places have seating available outdoors for the warmer months. It was a busy night at Silly’s when we arrived. We took the last two available seats at SWAT which were located at the end of the bar. There are a few things about the place that stood out once we were seated. The bar top was made of a huge number of corks. The staff all appeared to be happy and most were tattooed. There were lunch boxes on the tables that house menus, napkins, silverware, etc. And there were games such as Trivial Pursuit available to keep customers entertained. All of these added to the Silly’s craziness. We were given separate food and drink menus. Ordering from the drink menu was skipped in favor of water, but they had a number of specialty/signature drinks and a bunch of signature milkshakes. We could also make our own shake in which we had the option of including almost any crazy thing we could think of from bacon to Tang to avocado. The menus both had a great selection of vegan and vegetarian, gluten-free, and dairy-free options. Pretty much everything at Silly’s, from the sauces to the desserts, is made in-house except for a few items such as the falafel and jerk seasoning. That is definitely part of what makes Silly’s so special and, considering the size of the menu, it is very impressive. The food menu includes apps, dinners, wraps, pizzas, and lots of other goodies. In my experience, the cooks will adapt to almost any special request. If you can think of it, they will try to make it. On most of my visits I order the Nacho Nacho Man – Silly’s has some great names for their food – to start, and my wife usually orders the Fried Pickles. Both are shining examples of the great food at Silly’s. For the nachos, you can choose either corn or flour tortillas. I usually pick the flour for a change of pace since pretty much all nachos are made with corn elsewhere. The tortillas are then topped with two types of cheese, jalapenos, and scallions. You get homemade salsa, sour cream, and avocado pulp on the side. I order without avocado since I despise the mushy green stuff. You can get them vegan or with pulled chicken or herbed tempeh for an extra charge. 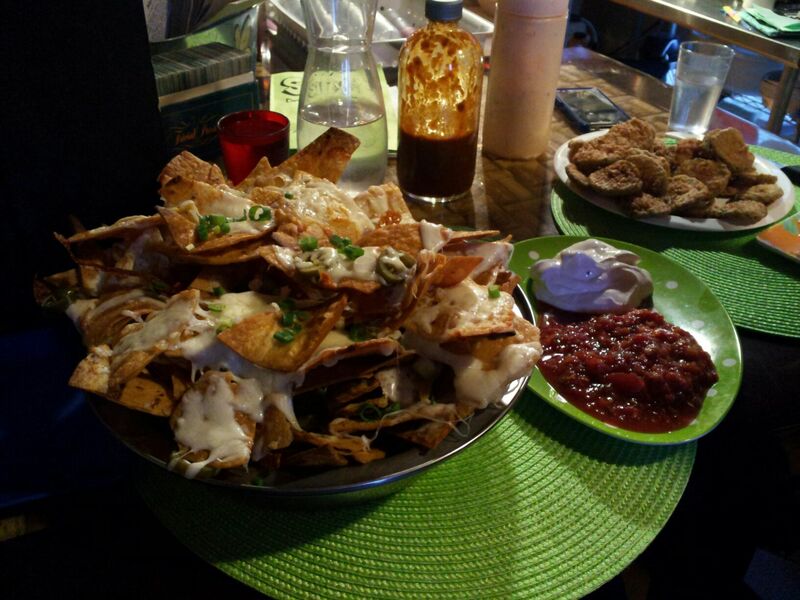 Regardless of how you prefer them, I believe these are some of the best nachos in Portland. For a guy who likes tons of toppings on his nachos, what makes the sparsely topped delights so damn good? First, there’s plenty of cheese. The flour tortillas are a nice twist on a traditional nacho. Also, the homemade salsa is one of the best I’ve had. I’m not even sure what makes the salsa so good, but it is really outstanding. Lastly, there is a secret ingredient which I add to make the nachos burst with spectacular and dynamic flavor. That secret ingredient is Silly’s house-made maple habanero hot sauce. Not too maple-y, nor too habanero-y, the combination of sweet and hot make their hot sauce probably the best I’ve ever had. I’m pretty sure it would go well on anything and next time I buy a bottle of hot sauce, that’s the one I’m buying. The fried pickles are my wife’s favorites and I must agree that they are some of the best in town. They have a slightly spicy breading and come with a whole condiment bottle of Silly’s spicy dip which seems to be some sort of southwestern sauce but is a bit tastier than what you might get elsewhere. You can also get them served up vegan-style for a small charge. We received our apps and I just about fell out of my seat. I don’t know if Silly’s had too many nachos in stock that day or they just knew how hungry I was, but I don’t ever remember their nachos being as big as I got on this night. Needless to say, I was pleased with the portion size. We placed our orders for the rest of the food, but I had it in the back of my mind that I might not even make it past the nachos. I ordered a Buffalo Fried Fish Abdullah Wrap and my wife a Falafel Abdullah Wrap. When the food came out, I was still working hard on my nachos and my wife on her pickles. We had pretty much resigned ourselves to the fact that we weren’t going to finish our meals, but it was getting to the point where we didn’t know if we were even going to start eating our wraps. Nearing the end of my nachos, I ran out of steam and my feeding frenzy came to a halt. I couldn’t even bite into my wrap. The fish had to be taken home. Mrs. Portlandeater had some pickles left, but took a couple of bites of her wrap and took the rest home. We were disappointed in our abilities to shove food into our face, but excited to have some left over. Our food came to $40 including tip and lasted for two full meals. That said, the meal was outstanding and the service is always excellent. When we ate our wraps at home the next day, they were yummy and really big. Mine had a whale-sized piece of fish in it, some blue cheese, buffalo sauce, lettuce, tomato, and possibly some other delicious additions. The falafel came with a cuke dill sauce and some veggies. If the food at Silly’s isn’t enough to get you there, you should also know that they take buying locally seriously and are very eco-friendly. Virtually all of the few items they don’t make in-house, they buy locally from small, family-owned businesses. Additionally, their services such as banking, laundry, and web site design are all purchased locally. They use eco-friendly products such as recycled and compostable take-out containers. They recycle plastic, paper, metal, cardboard, and the fryolater oil ends up used as fuel for vehicles. Check out their website for all the specifics. I like everything about Silly’s. They care about other businesses and what’s around them. The food is top notch. The staff is very friendly. Yes, the nachos are absolutely amazing, but I also highly recommend Rings of Fire, Beelicious Stirfry, and Chicken in a Boat which are some of my other favorites. I still enjoy trying new items too since they have so many delicious choices on the menu. I assure you they put out some seriously delectable goodness. If you haven’t tried the Portland staple that is Silly’s, you need to check it out as soon as possible. It might be the best restaurant value in Portland. This entry was posted in Portland, ME food on March 20, 2013 by peterpeterportlandeater.